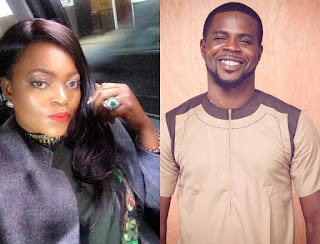 Last week or so, viral reports claimed that popular entertainer, Abdul Rasheed Bello a.k.a JJC and Nollywood actress, Funke Akindele got engaged. While we cannot confirm the marriage reports, we can indeed say that Funke Akindele and JJC have something going on between them, other than their work on the set of Jenifa Diaries. The two lovebirds involved a public display of affection (PDA) and a subtle locking of fingers as they dashed out of the venue together. The rumoured couple had earlier on, tried as much as possible to avoid each other on the red carpet as Funke Akindele made her entry, agood 30 minutes before JJC made it to the redcarpet. However, the pair couldn’t keep their plan airtight all night long… as they couldn’t wait to be in each other’s arms. Together, they left the venue on a night where the Jenifa Diaries star was rewarded with Best actress in a comedy movie/series for her workin the hilarious movie.